about the treatment of unwed mothers in religious institutions in Ireland. was effectively a declaration of war. SURVIVORS of mother and baby homes are set to sue the State and religious orders for hundreds of millions of euros. The Irish Sunday Mirror has learned that a top law firm has put together a team of six barristers to begin a series of High court battles. Spokesman for Irish First Mothers Fintan Dunne said the latest delay in the work of the commission was a "kick in the teeth" and survivors would now take a legal route. He told the Irish Sunday Mirror: " The commission is a mechanism for evading redress. They've has two extensions to the working report which was supposed to take 18 months and took three years." "We've had four interim reports now and nothing coming out of it." He added the commission's workload and resources meant it was unlikely to issue a final report before 2021. And he asked how no findings of culpability had been made with more than 500 witnesses already interviewed. 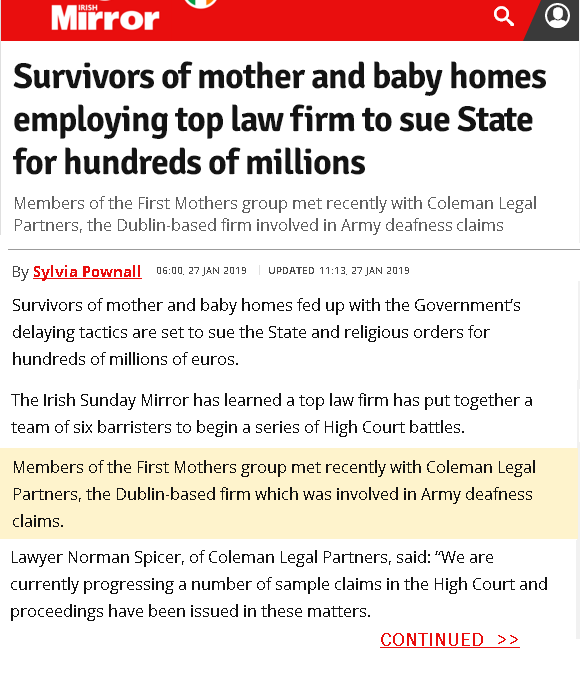 Members of the First Mothers group met recently with Coleman Legal Partners, the Dublin-based firm which was involved in Army deafness claims. 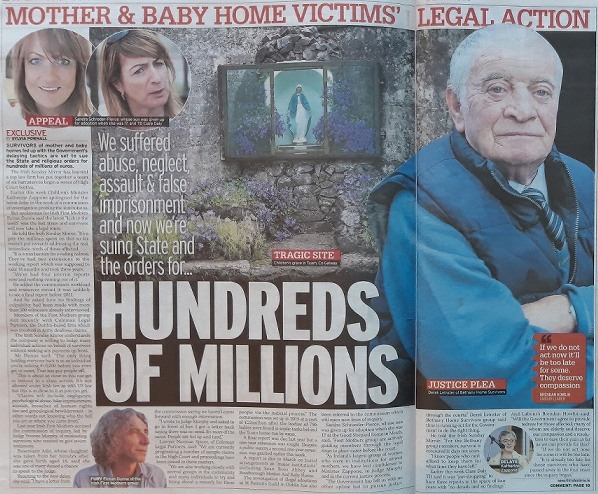 The Irish Sunday Mirror understands the company is willing to lodge mass individual actions on behalf of survivors without seeking any payment up front. Mr Dunne said: "The only thing holding everyone back is as an individual you're talking €10,000 before you even get to court. This is about as close as you can get in Ireland to a class action. Claims will include negligence, psychological abuse, false imprisonment, assault, breaches of human rights law and genealogical bewilderment -in other words not knowing who the hell you are or where you came from." Last year Irish First Mothers accused the commission of inquiry led by Judge Yvonne Murphy of misleading survivors who wanted to give sworn testimony. Rosemary Adie, whose daughter was taken from her minutes after she gave birth aged 18, said she was one of many denied chance to speak to the judge. Reacting to the new delay she said: "I have a letter from the commission saying we haven't come forward with enough information. I wrote to judge Murphy and asked to go in front of her. I got a letter back saying there was no need. it's more of the same. People are fed up and tired." Lawyer Norman Spicer of Coleman Legal Partners said: "We are currently progressing a number of sample claims in the High Court and proceedings have been issued in these matters." "We are also working closely with several groups in the community and many individuals to try and bring about a remedy for these people through the judicial process." The commission was set up in 2015 at a cost of €23 million after the bodies of 796 babies were found in septic tanks behind Tuam home run by nuns. A final report was due last year, but a one year extension was sought. Despite public outcry a second one year extension was granted earlier this week. A report is due in March on burial arrangements at "major institutions" including Sean Ross Abbey and Bessborough Mother and Baby home. The investigation of illegal adoptions at St Patrick's Guild in Dublin has also been referred to the commission, which will open new lines of inquiry. 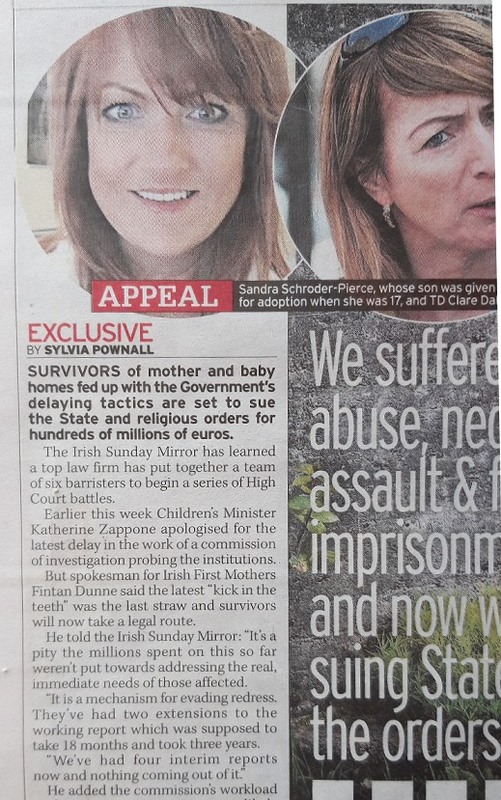 Sandra Schroeder Pearce whose son was given up for adoption when she was 17 at the Good Shepherd home in Meath, said: "First Mother's group are actively guiding members through the legal steps to place cases before the court." "As Ireland's largest group of women who were in institutions for unwed mothers we have lost confidence in Minister Zappone, in Judge Murphy and in the current justice process. The government has left us with no other option but to pursue justice through the courts." Derek Leinster of Bethany home survivors group said: "Time is running out for the government to do the right thing. He told the Irish Sunday Mirror: "For the Bethany group members survival is measured in days not years. I know people who can't afford to keep themselves for what time they have left." Earlier this week Clare Daly TD said it was "jaw-dropping" to have three reports in the space of four years with "no details and no findings". And Labour's Brendan Howlin said: "Will the government agree to provide redress for those affected, many of whom were elderly and deserve our compassion and resolution to ease their pain. If we do not act now, for some it will be too late. It is already too late for those survivors who have passed away in the 4 years since the inquiry began." All the best with the class action law suit! Hope everyone can find some justice in this world. I`ll keep an eye out to see how you guys are getting on!